Wild shrub rose of bushy habit and often suckering. 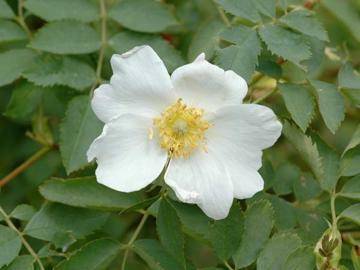 Strong thorny stems and greyish green pinnate leaves. Slightly scented white flower in summer, followed by small, hairy, red hips. Adaptable to most soils, sun or part shade, grows well on clay soils. Very hardy. From seed, which can be very slow to germinate, cuttings, layering or separation of rooted suckers. Native to Central Asia, usually found on rocky mountain sides and scrublands. Discovered by a Russian botanist, Olga Fedtschenko in the 1860's.